Disruptive enough? S40 to get 1GHz, CBD touch, 512MB RAM? S40 is meant to be the simpler “mobile phones” range, whilst S60/S^1/S^3/Maemo/MeeGo are the smartphone series. On June 21st we are expecting Nokia to reveal something disruptive – a word associated earlier on with MeeGo – but really could be anything. 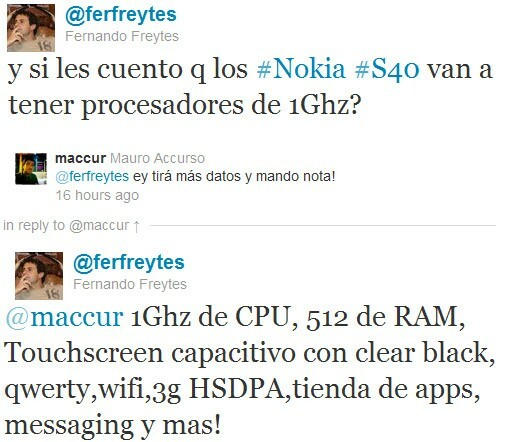 Engadget has found a couple of tweets from Nokia’s Manager of Marketing Services in Argentina who claims the first Nokia to officially come with 1GHz (not just overclocked N900s) would be the S40 range, with CBD touch screen and 512MB RAM. A bit of overkill? Why not? That’s not often something we’d associate with Nokia (who has, except the N900, just given their smartphones just ‘adequate’ levels). If this is what Nokia’s going to give S40, I wonder what we’ll finally get with the smartphone ranges? (MeeGo/Symbian/Windows Phone). I wonder what changes Nokia have done to S40 to utilise all that power. Imagine S40 becomes smartphones. Don’t they sell 1 million dumbphones a day? Now imagine all those as smartphones (though price is a BIIIG factor) and these specs suggest not so cheap. Why the spoiler now huh? I can’t find his linkedin profile but there are youtube videos of him, linked as Nokia staff.